I definitely feel proud of baked goods. You should be proud of this smooth and lush creation too! OMG, that pie looks magnificent! I am a rebel too. Fantastico el corte, esto tiene que estar muy rico. I officially declare you the best pie maker and photographer ever!! Nice, Grace! My sweet potato pie recipe is savory....this looks fabulous! And silky and who cares if it's February? This pie is perfect any month. I'll take a pie, anytime. And the sweet potatoes are SO good now. I had one for breakfast the other day drizzled with maple syrup, raisins and (confession) blue cheese. Grace, couldn't agree with you more. I've never made a sweet potato dessert even though I do love this starch and always have it on hand. Sweet potatoes show up often, usually in savoury dishes, but I am always willing to give sweet a try, and you made this delectable sweet pie from scratch even better! Oh yes, I would sure like a bite of that beauty! A pie that looks that good should not be eaten only at Thanksgiving...drool! You are a rebel!!! Yummy spud pie! Oooooh! Pretiest pie close-ups ever! The filling looks like candied fruit paste. I definitely agree that whenever you can find the ingredient easily, it just means it's still time for the pie! Pie!! You renegade, making it in February! It looks lovely, and this is coming from a girl who doesn't like sweet potatoes. there is NEVER a bad time for pie. Especially not if it involves sweet potatoes. And cinnamon. Hellz yeah. Grace - I am gaining weight just by looking at your photos, absolutely mouthwatering! Agree with you on the sweet potato - fried, baked and stuffed or in a pie - YUM! I must confess that I am a seasonal eater. That said, nothing tastes as good as indulging in an out of season treat. Oh, I'm all about fall foods at non-seasonal times. :) I've still got cranberries in my freezer that I can't bear to finish off because they won't be around again for another 9 months! Yum. I've never had sweet potato pie, but good heavens, I'm pretty sure I need to change that now. Perfect pie! I could never get tired of sweet potato pie. Yum. You did see my non-seasonal cranberry sherbet. I also made out of season cranberry bars, like brownies only not chocolate, this week. I'm all for out-of-season foods! Your pie looks creamy and delicious. I've never had sweet potato pie but now, suddenly, I have a massive craving for it. It looks perfect. We continue to get local sweet potatoes long after Thanksgiving so I see no reason not to turn them into pie! Looks fantastic. You have stolen my heart with this one, Grace! Not only do I love sweet potato pie, but I bet it's even better in February to help chase away the winter blues! 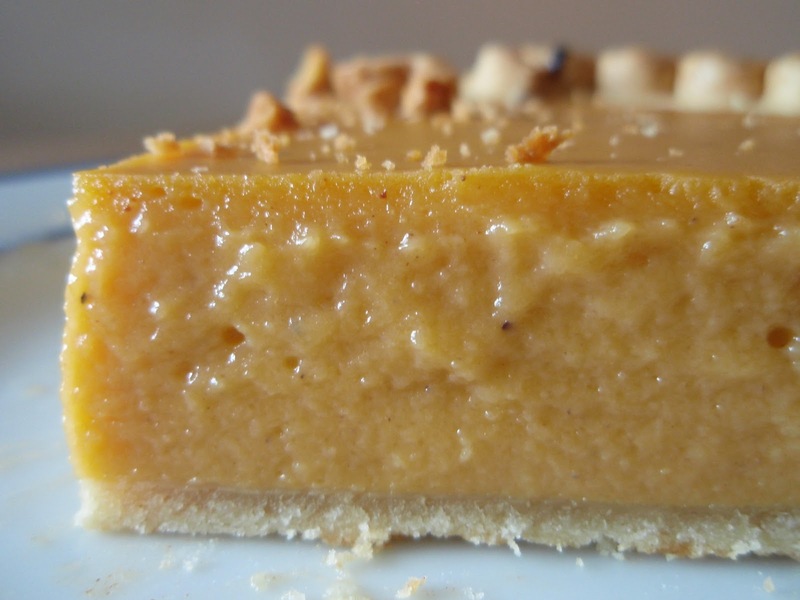 I've never tried sweet potato pie, but I surely do love me some pumpkin pie any time of year. I bet this is just delish. Hi, stranger! 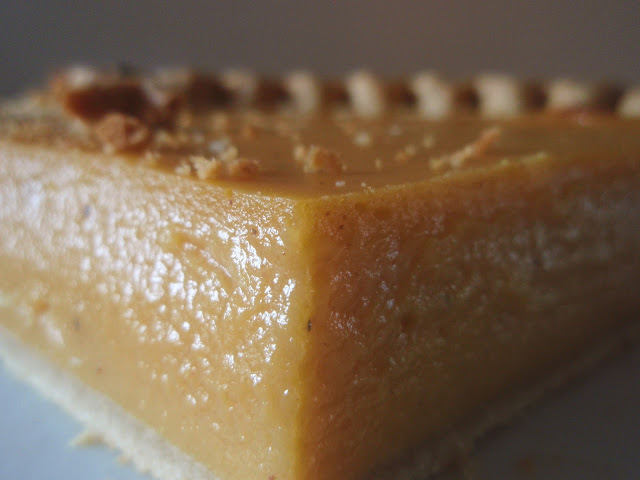 Pie is my FAVORITE dessert, and I've only recently come to love sweet-potato pie! Gotta try this. I love sweet potato pie! Who cares if it's February, it doesn't change how delicious it tastes. :) Your looks like perfection! The perfect way to remember to be thankful anytime of year... with pie! Oh goodness, that looks delicious! yum! Would you hate me if I told you I'd never had sweet potatoe pie? Or would you just feel sorry for me and come make one for me? I have never had a sweet potato pie before, which is crazy considering what a pie fan I am! This looks delicious, though - I need to give one a try! do we really need a good reason to eat your pie in february !! I think we should eat it to celebrate every day !! Hi Grace! Guess what, February is National Sweet Potato Month. I know this to be true because I just received an email from the Benny Graves @ The Mississippi Sweet Potato Council after I inquired for a future post this month. He confirms it is and I'm running with it. I am so saving this recipe to share. Who knows, after seeing your gorgeous piece of loveliness, I may even try my hand at baking one myself! Thank you so much for sharing, simply awesome!!! You ROCK!! I love your attitude and awesome baking ability!! You Miss Grace are a kick in the head, I mean that in a good way. I love your stories and of course the pie. I could any and all kinds of pie 24/7 365. Wow, such an incredibly delicious looking pie there! I love your closeup shots! Happy February! It's hard to believe we're already a month into 2011. Oooh what food pornalicious close ups my dear Grace! This looks and sounds amazing! The spicing, the textures, everything. Good for you, you rebel there ;p.
Any time is pie time. Such a lovely looking slice ! What a beautiful slice! I made sweet potato pie for the very first time last fall. I wasn't so into it, but yours looks infinitely better than mine! Mmmm I'm glad you made sweet potato pie! I think it should be made all year. It's my favorite. It looks GOOD. Really, really, really, really, really good. Those pictures are making my mouth water...for a piece of that pie. Thanks for sharing...I'm going to try making it. oh yummy! what a fantastic pie! Your sweet potato pie is so well photographed by you!! Waw!! I have never eaten sweet potato pie before in my life because it isn't used here a lot in Belgium. Most people don't know what sweet potatoes are!!! I must make this one for my mother because she has been wondering how it tastes like,..& so do I! Oh yes, sweet potato pie is good any time, not just at Thanksgiving; I love the way your pie looks Grace-so creamy and smooth, speckled with spices. Now I want it. Great job! Sweet potato pie should be enjoyed year round - what a treat! You wild thing you! :) Sweet potato is heaven year round in my book... particularly in a pie like this. Good work! I love reading your commentary- you're brilliant! I wish we were next door neighbors! I've never had sweet potato pie but I imagine it would be good as it reminds me of a dessert that we make with cassava here in the Caribbean. Boo Yah! So when is it not a good time for sweet potato pie! A rebel with a yummy cause! love it :) beautiful pictures. I was just telling a friend yesterday, it's ALWAYS a good time for pie! Boo-yah is right!!! That looks absolutely scrumptious! I've never even tasted sweet potato pie...shameful, I know! The texture looks amazing. Silky, smooth, thick....gotta try some, I think. Yessss please! I will eat sweet potatoes any day, especially if it is in the form of a pie! Yumm! I wish my family was into pies as much as I am. I just prepared it last night.. It was really delicious.. Thanks a lot for posting....I love cooking!! !